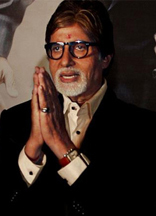 Megastar Amitabh Bachchan, whose film 'Sooryavansham' has completed 16 years since its release, feels the movie has a personal connect with many. The film is a 1999 drama that revolves around a man who defies his father's wish and marries a woman, following which he struggles to make a living. 'Sooryavansham' is the Hindi remake of the 1997 Tamil film 'Suryavamsam', which stars Sarath Kumar and Devayani. "SOORYAVANSHAM...16 years... many still watch this film repeatedly...it has a personal connect with many," the 72-year-old actor tweeted. Taking to his blog to write about the movie, he posted: "It was a remake of a Tamil film that ran most successfully - the Tamil film - and carried a great challenge for the artist involved and for the makers in Hindi." Reminiscing the movie, he said that 'Sooryanvansham' was shot in multiple exotic places like Sri Lanka, Gujarat and Hyderabad, as well as the "most picturesque parts of that emerald in the Indian Ocean". Directed by E.V.V. Satyanarayana, 'Sooryavansham' also features Jayasudha, Soundarya, Rachana Banerjee, Anupam Kher and Kader Khan. Soundarya, who was paired opposite the megastar in the film, died in an aircraft crash near Bangalore in April 2004 when she was on her way to Andhra Pradesh to campaign for the Bharatiya Janata Party for the then upcoming elections.